This demonstration requires the same kind of set-up as the simpler example on the previous page, so we provide here the code of the unit and of the form rather than stepwise instructions. 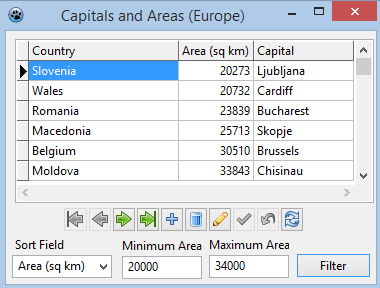 Whereas the first example used trivial data, this one is useful for comparing areas of European countries. We copied the areas from this Wikipedia page. The code follows a screenshot of sorting and filtering in action.